This window lets you manage breakpoints. When the window is opended, it displays a listbox with all currently set breakpoints. 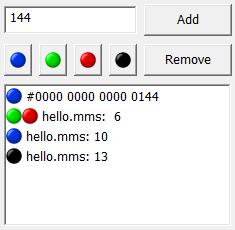 For example on the right you see four breakpoints: an execute breakpoint at address #144, a read and write breakpoint in file hello.mms, line 6, an execute breakpoint in the same file at line 10, and finaly again in the same file a trace point in line 13. Before you can modify one of these breakpoints, you must select it by clicking on it. The breakpoint is the shown higlighted (with a blue background). You can the remove the breakpoint by pressing the Remove button. You can add an execute, read, write, or trace breakpoint for the selected breakpoint by pressing the blue, green, red, or black button respectively. Pressing the button a second time will remove it again. When you double click on a breakpoint showing a file and a line number, the cursor in the edit window will move to the specified line. There are two types of breakpoints shown in this list: breakpoints that are bound to a specific line in a sourcefile and breakpoints that are bound to a specific address. You must add breakpoints of the first kind using the editor. You can add breakpoints of the second kind by entering the address in hexadecimal notation in the editbox shown left of the Add button and then pressing the Add button. When you edit the file, the editor will move around the breakpoints in the text together with the text. These changes are not shown in breakpoint list. However when you start the debugger, the list will be updated. If you change the source file while the program is running, neither the breakpoints in the running program nor the breakpoints in the list will be updated. This is not a good idea. You should stop debugging, edit the file, then assemble it again, and finaly restart the debugger.